An image of two children standing in a green field while reading books. Our minds go through an entire array of thoughts, feelings, and emotions while we read. There are also numerous background activities going on in the brain while we read that enhance literary experiences and can have both short and long-term effects on the reader. What Happens While You’re Reading A Book? To you, reading may just seem like a daily task, requiring you to repeatedly run your eyes across the page to get the information you desire. However, an article on the Open Education Database (OEDB) enumerates several other processes our minds perform in the background to allow reading to give us the knowledge and satisfaction we need. The first on the list: visualization while reading is involuntary. The article states that visual imagery is simply an automatic reaction that doesn’t require an outside prompt. This allows the reader to simultaneously imagine whole new worlds as the words on the page slowly piece it together for them. Also mentioned in the OEDB article, our brain doesn’t make a distinction between reading about an experience and actually living it. The same neurological regions are stimulated despite if it is a real experience, or just reading about one. What Happens After You Finish the Book? Reading fiction can give you social expertise, by allowing you step into the world of the characters and navigate through social situations with them. Literature can destabilize personality by enabling the reader to empathize through the ups and downs of the plot. This can in turn allow the reader to open up to their own inner experiences. Literature is an indirect communication method that encourages the reader to make inferences about how the characters are feeling. In the same way that people learn to understand how and why people feel the way they do, literature helps one understand in a similar way. Words Alive knows that reading is not only an engaging activity for the mind, but it can have long lasting effects on the social and emotional side of the reader as well. We aim to provide the tools needed to underserved students and families so that they can fully reap the benefits of reading. If you would like to learn more about the programs that we offer and get involved, visit our page here. Teachers from the school site 37ECB stand in front of posters about facilitation tips that the students created together. Their semester culminated in a project in which the students were in charge of facilitating discussions. In the 21st century, we have access to millions of pieces of information in less than a second. This shift in immediate availability of information changes not only how the workforce operates, but also how we prepare students to enter the workforce. One of the ways in which some districts and schools are addressing this is to place less emphasis on the traditional teacher-to-student lectures and instead focus more on building skill sets of students that allow them to succeed in the demands of a technologically-savvy workforce. By changing the focus from the typical teacher-to-student led classrooms, and instead focusing on empowering students to discover their own hurdles, find their own answers, and teach others their findings, students are being taught important life-long skills. In a publication by eSchool News that focuses on how to make the shift to student-led learning, the top 10 skills that are needed in 2020 as identified by the World Economic Forum were listed, including complex problem solving, people management, negotiation, and critical thinking, among others. However, these skills cannot be taught from a teacher, they need to be observed, practiced, and given feedback. The ability to learn from peers and find resources is the key difference in student-led education versus traditional teaching formats. What are the Benefits and Challenges of Student Led Education? Image of former ABG student, Daimeon, facilitating a book discussion with current ABG students at La Mesa Community School. There are multiple reasons why more of an emphasis is being placed on student-led education. As discussed in an article on teachaway.com that outlines the benefits of student-led learning, when students take the lead in teaching, they focus on ideas that interest them more, which paves the way for a deeper understanding and more enjoyment and fulfillment from the topic. Students also tend to relate to their classmates more, meaning they may pay more attention and even understand them better than they might a teacher. In this teachaway article, a pilot study from a university was cited in which students were given autonomy on how to structure the classes themselves in an effort to increase class attendance and exam performance. Student involvement and class attendance increased, which in turn improved the grades of the students in the pilot study. Similar teaching styles are being implemented across the world and to students of all ages to empower them to take more control over the learning process. In the workforce, teachers are not readily available to answer questions and lead employees to the right resources. It is up to employees to find resources themselves from peers or online. Allowing this skill to develop while also enabling students to discover what interests them is becoming more important, as more schools shift to this methodology of teaching. The Words Alive Adolescent Book Group includes book discussions, activities, and projects that are often times led by the student participants. This allows them to get comfortable speaking in front of others and encourages more involvement amongst their peers. If you are interested in funding these student-focused literacy programs, visit our website here for more details on our upcoming Author’s Luncheon & Fundraiser! The 15th Annual Author’s Luncheon & Fundraiser is coming up on October 19th and this year our signature fundraising event theme is: Fund a Mind, Transform a Life. This event is important to our organization in many ways, but the most important is this: the Author’s Luncheon & Fundraiser provides a significant amount of our income and allows us to continue to deliver high-quality literacy programs all over San Diego. When you buy a ticket to the event, donate towards a silent auction item, or contribute in the ballroom on the day-of, you are helping us fund the minds and transform the lives of the students and families we serve. Every dollar you donate at the Author's Luncheon & Fundraiser helps to fund the minds and transform the lives of the students and families we serve. Literacy is a foundational skill that is so easily taken for granted by many, yet nearly 450,000 San Diego County residents are considered illiterate. Literacy is a skill that is shown to not only have a relationship to someone’s socioeconomic status and earning capabilities, but can also transform one’s life by allowing them a well-rounded and fulfilling education that enables them to effectively communicate and participate in the communities around them. According to the EARLY WARNING! Why Reading by the End of Third Grade Matters report by the Annie E. Casey Foundation, up until the third grade, most children are learning to read. Beginning in the fourth grade, however, they are reading to learn, using their skills to gain more information in subjects such as math and science, to solve problems, to think critically about what they are learning, and to act upon and share that knowledge in the world around them. This turning point at the end of the third grade is why growing amounts of resources are being directed towards children in Kindergarten through third grade. An image of one of our Read Aloud Program volunteers reading to a classroom at Golden Hill School. In fact, research like this is the reason why we have strategically designed our Read Aloud Program to target this age range. Reading aloud to young children is the most important thing we can do to help them become motivated, strong readers and in the Words Alive Read Aloud Program trained volunteers read aloud each week to approximately 4,300 children from early childhood education and Title 1 - eligible elementary school sites across San Diego. Additionally, research from Yale University has indicated that three-quarters of students who are “poor readers” in third grade will remain “poor readers” in high school. Not surprisingly, students with relatively low literacy achievement tend to have more behavioral and social problems in subsequent grades. By focusing on providing additional literacy resources during these key years, it is helping to ensure that these children have the tools to succeed in following years. Effective literacy education needs to reach more than just the students that are between Kindergarten and third grade, however. An article published on WCNC states that reading to your child, even in the womb, can activate brain development, increase vocabulary by 24 months, and decrease risk of speech delay. Though this is a known fact amongst experts and doctors, not all parents are aware of the importance this holds on their child’s future success. Educating families as a whole on when to read to their children and what techniques they can use is equally important. Literacy skills can start building from an early age and are building blocks for reading proficiency by the end of third grade. An image of one of the kids in our Family Literacy Program standing in front of a huge cutout of the Hungry caterpillar! 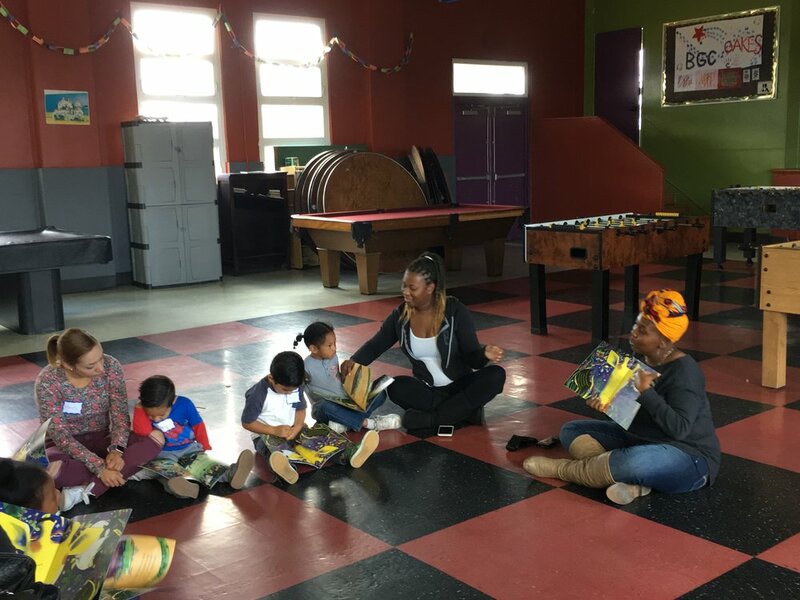 Words Alive’s Family Literacy Program aims to empower parents as agents of change and advocates for their families by meeting parents where they are and giving them the "ah-ha!" moments that lead to deeper engagement with their children. Parents in the program attend seven workshops, receiving approximately ten hours of parent education covering early literacy development topics specific to preschool age children. Each workshop includes a tailored information session and skill-building exercises for parents, a group story time, and guided activities for parents and children. As we know here at Words Alive, literacy goes beyond the simple act of reading words off a page and interpreting their meaning. Dr. Berninger, Professor Emerita of Educational Psychology at the University of Washington mentioned in a New York Times article, “Literacy involves all aspects of language, including our oral language, what we hear and say, and our written language, what we read and write.” She called it “language by ear, mouth, eye and hand.” As children grow and develop, they cannot be denied the resources that allow them to learn these skills. All of our programs at Words Alive aim to , ensure that children are able to build the skills that can transform their lives and help them become well-rounded individuals with the power to change their communities for the better. Simply put: Words Alive uses all donations to fund the minds of children, which helps them transform their lives. Join us for our Author’s Luncheon & Fundraiser, where you can enjoy a wonderful afternoon while knowing that your actions are making a difference in the state of literacy education in your community. Click here for more information, and to purchase tickets or a table for the 15th Annual Author’s Luncheon & Fundraiser.